What motivates you to make a change? For many of our members, motivation starts with the anticipation of a life change or big event. Channeling that excitement into a fitness goal often brings great results. That was the case for Juanita, who works out at our Elk Grove club. Juanita's motivation kicked in when her son got down on one knee and proposed to his girlfriend. Looking forward to a wedding, Juanita decided to set some health and fitness goals. "I had joined the gym a year earlier, but had no results trying to work out on my own," she admits. "I was feeling sluggish and very unhealthy." Instead of getting discouraged, Juanita decided to ask for some help. She reached out to the manager of her club, who suggested Body Fit. "He felt Anouschka's class would be a good fit for me," Juanita notes. Turns out, that recommendation was spot on! Calling Anouschka her "guiding light," Juanita describes what it is like to participate in her Body Fit group. "She welcomed me the first day with a hug and everyday after that when I come in I am welcomed with a big hug and smile. Anouschka encouraged, corrected and guided me the whole way. If I fell off the wagon she reminded me it was just one day, week or even weeks--but to continue attending and she would get me to where I needed and wanted to be. She is constantly asking each of us what we want to work on this week and she puts the exercises needed in the training for the week. I can go on and on about this women--she is why I keep going to Body Fit!" Juanita felt that Anouschka really helped her Body Fit group become a supportive, cohesive community. Making friends with similar goals helped Juanita, and she began joining them for other group fitness classes. "Attending with my Body Fit friends made all the other classes really fun, too." 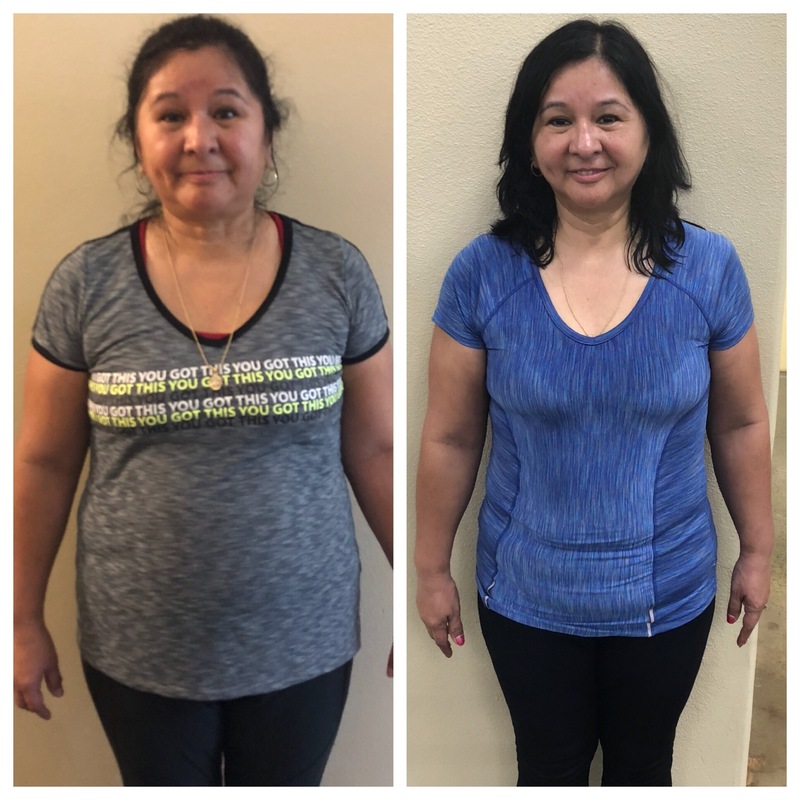 When asked about the results she's seen since she began participating in Body Fit, Juanita shared, "Physically I am feeling wonderful. I have more energy, I am stronger, my balance is better, my endurance is better and I don't get winded anymore unless I really push myself hard." Physical changes aren't all that she's noticed, either. "Mentally and emotionally I am a completely different person--I am happy and feel less stressed and overwhelmed. Instead of overreacting to the small things now, even the large things that happen I take in stride. I have a lot more patience. My confidence has grown and others have commented that I seem so happy now," Juanita glows. Finding guidance and supportive workout partners has been the key to Juanita's success. "If I did it, anyone can do it--just find the support system," she encourages. We can't wait to see the pictures of Juanita dancing at her son's wedding! If you'd like to learn more about Body Fit group training, click here.